In the LSST optical design, the 8.4 m primary (M1) and 5.0 m tertiary (M3) mirrors form a continuous surface. Because the two mirrors curve differently, a slight cusp is formed where they meet, as seen in the picture below. This design makes it possible to fabricate both the primary and tertiary mirrors from a single monolithic substrate, the M1M3 monolith. mold was built with the honeycomb cores, the glass was layered on top, and as the mirror oven heated and spun, the glass slumped into the mold forming the back of the substrate. Spinning the hot glass created a roughly parabolic surface that was ground and polished into its final shape. 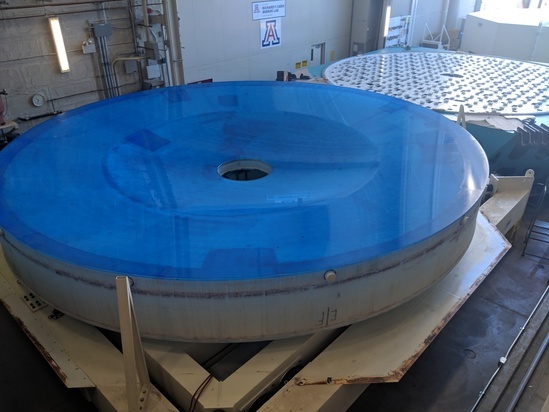 The Steward Observatory Mirror Lab at the University of Arizona began casting this mirror in the spring of 2008, and final polish was completed in February 2015. On May 19th 2015, the completed LSST Primary/Tertiary mirror (M1M3) was safely moved from the UA's Richard F. Carris Mirror Lab (formerly SOML) to long-term secure storage at Tucson International Airport. In late 2018 the mirror was returned to the Mirror Lab for optical testing, and in early 2019 it was shipped to the summit facility on Cerro Pachón. At 3.42 m in diameter, the LSST secondary mirror (M2) is the largest convex mirror ever made. The mirror was created using a 100 mm-thick, solid blank made of a low expansion glass similar to that used for the Southern Astrophysical Research (SOAR) and Discovery Channel telescopes. The mirror is supported above and facing the M1M3 monolith and the alignment of the three mirror surfaces is maintained using systems of actuators—small motors that can make tiny adjustments to the position of the mirror from several angles. A large conical baffle prevents the direct reflection of starlight from the tertiary mirror into the camera. Because of this configuration, weight is a concern for the M2 mirror assembly and without modifications, the solid glass mirror and assembly would weigh 11,450 lbs (5205 kg). To reduce the weight, 1735 lbs of glass were removed from the back, leaving a ribbed structure behind a 19 mm sheet of glass as the mirror's face (see above). The final weight of the mirror is 1500 lbs (680 kg), while the total weight of the assembly is now 5970 lbs (2714 kg), 52% of its initial weight. The lighter assembly dramatically reduces the demand on the supporting structures, cell and actuators required to support the mirror. Harris Corporation manufactured the M2, as well as the mirror's cell assembly, which consists of the polished secondary mirror, mirror support system, mirror cell electronics and sensors, thermal control system, and the mirror control system. The M2 was shipped to Cerro Pachón in early 2019.